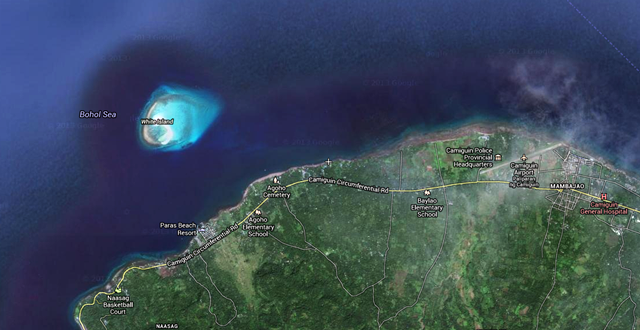 When in Camiguin, don't ever go to the WHITE ISLAND, also known as Medan island. Don't tell me later that I did not warn you beforehand. Please. Don't go to the White Island . . .
. . . because you will surely fall in love with that place. You will enjoy frolicking on and rolling over and over the white sands of White Island, which is actually a small stretch of uninhabited sandbar off the coast of the main island of Camiguin. You will be like these two individuals in the picture below who so love lying on and rolling over the sands in White Island. Oh, the guy on the left said he got off balance and that explains why he seems to be rolling over the sands when this shot was taken. Tsk! Tsk! Tsk! The sands in some part of White Island are not as fine and powdery as Boracay's but the serenity in the area and the volcanoes in the main island of Camiguin in the backdrop will more than make up for that. In fact, many foreign tourists liken visiting White Island to having a luxurious Hawaii vacation apparently because of the volcanoes in the mainland that serve as backdrop to the pristine white sands of White Island which is surrounded by crystal clear waters. So you need not go to Hawaii (and spend a lot) to experience this kind of luxurious vacation. Some tourists go to the White Island for diving. White Island is sandwiched by colorful coral reefs on one side and black corals on the other. A word of caution though: The water current surrounding White Island can be very strong at times. There are no trees, vegetation or permanent structures on White Island that could give you some shade or protection from the sun. So, make sure to bring umbrella, hat, sunglasses, sunblock, food and water with you. It's better to go there as early as 5:00 a.m. or 6:00 a.m. and leave at 8:00 a.m. or 9:00 a.m. to avoid the scorching sun at midday. You can also go during late afternoons but some parts of the sandbar may be submerged due to high tide. As of late, however, makeshift stalls made of bamboos and tarpaulin tents were set up by vendors who sell food and water and offer tables, chairs, umbrellas, snorkeling gears, life vests and other items for rent. Of course, the prices are a bit high compared to those found in the mainland. So, better bring your own food, water, and other items that you may need while on White Island. In my opinion, these makeshift structures destroy the beauty of White Island. Instead of putting up stalls, vendors could sell their wares from their banca (outrigger boat) while docked on the White Island. They should not be allowed to set up stalls on White Island itself. The tourist police outpost at Barangay Yumbing pier beside Paras Beach Resort also serves as a cashier where you can pay Php480 to rent a banca (outrigger boat) to take you to the White Island within ten (10) minutes and back. Each banca can carry up to a maximum of 6 passengers. So you can share the rent with other passengers to minimize your expenses. Port operation is from 5:00 a.m. to 5:30 p.m. Starting March 01, 2009, you also need to pay an environmental fee of Php20 per passenger for marine life protection and cleanliness drive of White Island. You may also hire outrigger boats from nearby beach resorts like Paras Beach Resort or Pabua's Cottages or Paguia Cottages where rates may be lower than those at the pier.